How important is a print version of the OpenSCAD manual as opposed to the online version? WikiBooks expects all books to have a printable version. Personally, I find this of no value for OpenSCAD, although I have occasionally printed short sections. Using the manual online allows creation of a virtual order. The disorder of the some files is only visible when scrolling from the selected topic to those adjacent. The fact that some topics are physically grouped illogically is less important than in a printed version. The cheat sheet is a excellent example of a virtual ordering. To maintain its usefulness, it only includes the most popular topics. So my question: Is maintaining a print version of OpenSCAD worthwhile or should we drop the pretense and simply state that a printable version is not available? There are some times, I have used OpenSCAD remotely. Read that sans Internet. Like at club meetings, where there is no internet available. I have lamented the fact that I can't use "offline" help. Especially the cheat sheet. wget -k -r -l20 ‐‐execute robots=off http://www.openscad.org/cheatsheet/index.html?version=2016.01.27, and that command works for some stuff, but not for the cheatsheet. I would LOVE a cheatsheet that I could use locally "offline". If writing good code requires very little comments, then writing really excellent code requires no comments at all! The online version has grown without regard to being part of a print book. logical arrangement can result in some files being printed multiple times. is less important than in a printed version. its usefulness, it only includes the most popular topics. be very useful. HTML. Help. PDF with working links. Whatever works. > Internet. Like at club meetings, where there is no internet available. > that command works for some stuff, but not for the cheatsheet. > I would LOVE a cheatsheet that I could use locally "offline". is a "printable version". What that really means is that it is organized as a single long HTML file, and the table of contents at the top is accurate, since it is automatically generated from the contents. You can search the entire language reference manual using the "search within this page" feature of your web browser. The benefits of this version, for me, have nothing to do with printing. There is another table of contents for the Language Reference Manual at https://en.wikibooks.org/wiki/OpenSCAD_User_Manual, but it isn't not automatically generated from the print version. It's not maintained, and it's inaccurate/out of date. It should be deleted, or we should find some way to transclude the correct TOC from the print version. I don't use the regular user manual, but if I did, I would prefer to use the printable version, to take advantage of online searchability. Sounds like it needs some maintenance. I recently fixed some bad problems with duplicated content in the "printable" version of the language reference manual, and from your description, it sounds like the user manual suffers from the same problems. > be very useful. HTML. Help. PDF with working links. Whatever works. script to fetch and cleanup the HTML pages. needs to be a little bit more than just call in every build. I found the github link in that thread, and downloaded and ran the openscad_offliner.py script. I disagree with the statement that the contents at https://en.wikibooks.org/wiki/OpenSCAD_User_Manual, is not maintained and is inaccurate/out of date. When was the last time you looked at it? I found it when learning to use WikiBooks. Don't remember exactly where. 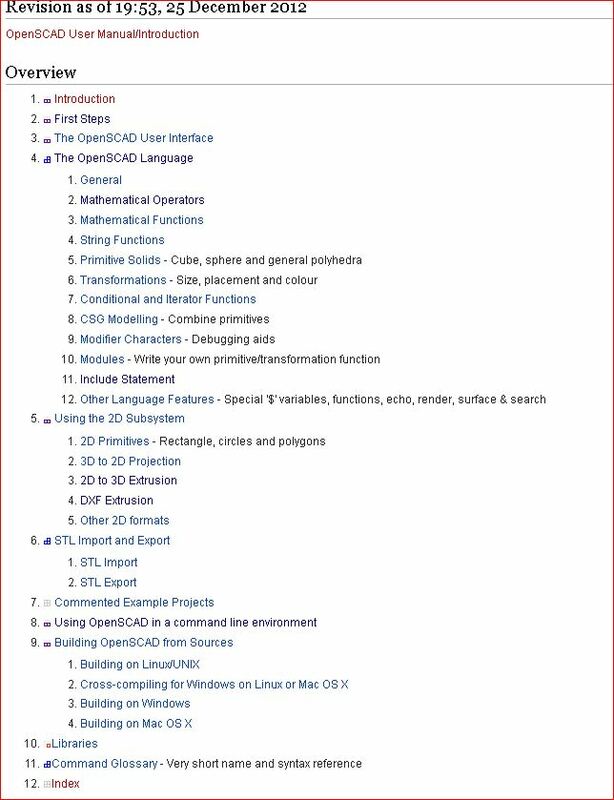 The table of contents for the language reference manual at /OpenSCAD_User_Manual is different from the table of contents in /OpenSCAD_User_Manual/The_OpenSCAD_Language. That's to be expected, because the former has to be edited by hand, while the latter is automatically updated each time somebody modifies the language reference manual. There are lots of sections missing from the manually edited table of contents, that are present in the automatically generated one. For example, section 1.6 (Getting Input), section 6.1.2 (intersection_for), sections 6.2.5 to 6.2.8 (vector and matrix operations), section 8.7 (parent_module). I also noticed that the automatically generated TOC was missing a section header for Use and Include, so I just added the missing header. I did some research and I find there is no way to transclude the automatically generated table of contents from The_OpenSCAD_Language into OpenSCAD_User_Manual. I don't like the idea of having two TOCs that are out of sync, so my proposal is to delete the one that is manually maintained, and keep the automatically generated one. inaccurate/out of date. When was the last time you looked at it? The table of contents for the language reference manual at /OpenSCAD_User_Manual was the same as the table of contents in /OpenSCAD_User_Manual/The_OpenSCAD_Language until someone recently deleted the copy from /OpenSCAD_User_Manual/The_OpenSCAD_Language. Yes, the automatically generated one needs less work to maintain. The problem is it reflects the lack of logical order to the contents. When coupled with the length of the generated TOC, it becomes very difficult to use it for navigation. In the long run, it would be desirable to reorganize the content of the various files to reflect a more logical order, thus allowing the generated TOC to be easier to navigate. @Larry: I agree, I'd like to reorganize the material in the Language manual into a more logical order, and make the automatically generated TOC easier to navigate. I've made a start at that with my recent changes, but that's just been minor cleanup work, fixing obvious bugs. And currently, the automatically generated TOC has basically the same structure as the manually edited one: neither is ideal. One way to shorten the automatically generated TOC is to limit the depth to 2 or 3, which causes MediaWiki to ignore section headers deeper than this (currently we have up to 4 levels of section headers). TOC to be easier to navigate. I've added some markups on both pages to transclude the table_of_content on /OpenSCAD_User_Manual/The_OpenSCAD_Language to /OpenSCAD_User_Manual so we don't need to edit it by hand any more. Not sure if it works 'cos it is awaiting approval from Michael. way to transclude the correct TOC from the print version. I have done much of the customisation of that TOC, in an endeavour to have direct links to the individual keywords rather than just to the section as per the automatically generated one. Also to keep it compact so you don't need to scroll the TOC. I do periodically update it, but haven't got to it for a while. I have just taken a copy so if people want to do something else, I'll just stick it as sandbox page and use it myself. It doesn't look any different in preview. I just rolled it back as it was conflicting with my updates. I'll retry it after I save my updates (the list Doug had above). Personally, I think the print versions are less useful, but as per Doug doing searches on it that is obviously a usage style difference. I do think the current version is a more usable TOC, even tho it needs manual handling.